There are so many interesting and valuable texts in the silent cinema field being added to the Internet Archive, but this latest addition to the Bioscope Library is perhaps the most exciting and important yet. 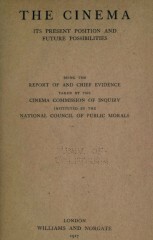 The Cinema: Its Present Position and Future Possibilities (1917) is a report and summary of evidence taken by the Cinema Commission Inquiry, instituted by the National Council of Public Morals. Essentially, it is a thorough investigation into the cinema in Britain and what its effects might be on the viewing public. As the introduction states, the National Council on Public Morals was “deeply concerned with the influence of the cinematograph, especially upon young people, with the possibilities of its development and with its adaptation to national educational purposes”. In other words, many in authority were alarmed at the popularity of cinema among those it deemed dangerously impressionable, and they wanted better to understand it, and to establish greater control over it. But they also wanted to find out what was best about it, and to replace hearsay with evidence. To report to the National Council the evidence taken, together with its findings and recommendations, which the Council will publish. The detailed report that was published is an unmatched treasure trove not only of opinions, fears, hopes and prejudices regarding the cinema and its audience, but of evidence relating to the production and exhibition of films in Britain at this time. Those supplying evidence included Cecil Hepworth, J. Brooke Wilkinson, A.E. Newbould, Gavazzi King and F.R. Goodwin, all key figures from the film industry, teachers, policemen, magistrates, social workers, and children. A considerable number of people look upon the attendance of children at cinematograph entertainments with dislike if not with horror, and are apparently inclined to accuse the picture shows of being the main cause of juvenile misdemeanours. I do not agree with this view, and am firmly convinced that there is great exaggeration committed by this class. In my opinion these people are always to be found on the side of opposition of popular and cheap amusements for the working classes. The picture show is undoubtedly very popular with the women and children of the working class, but then it is still new enough to be a novelty, and it must be remembered that no other form of entertainment has ever offered to the poor the same value in variety and comfort for a very small outlay. Secondly, there is invaluable statistical evidence provided by the film trade, including numbers of cinemas nationally, seats occupied, prices, investment in the cinema industry and the amount of film in distribution. Much of this data is unique to the report. Q. What do you like best at the cinema ? A. Mysteries; and then Charlie Chaplin. A. Mysteries, and Charlie Chaplin. Q. What do you mean by mysteries? A. Where stolen goods are hidden away in vaults so that the police can’t get them. A. Cowboys; and then Charlie Chaplin second. Q. When you have seen these pieces showing thieving and people catching the thief, has it ever made you wish to go and do the same thing? Q. Do you think the fellow who steals, then, a fine man? Q. But you would like to do it yourself? Q. Do you like the adventure or what? A. I like the adventure. Q. You have no desire, then, to steal in order to get things for yourself, but you like the dashing about and getting up drain-pipes and that sort of thing? A. No, I don’t like that, I should not like to do that. Q. Do you like pictures where you see flowers growing? Q. Do you like ships coming in and bringing things from distant lands? Q. You like to have a consistent programme of detective stories and Charlie Chaplin, and you don’t want any more? Q. Do you sit amongst the girls? Q. What do you pay? Q. Do you ever have to sit on the ground? A. No, we always have a seat. Q. Have you ever seen the boys behave roughly to the girls? A. Aim orange peel at them. Q. Do they pull the girls about? Q. And do the girls pull back again? A. No; they seem to enjoy it. The Report was generally favourable towards the film industry, which was delighted to receive such vindication of its work. The Report recommended the implementation of a system of official censorship, superseding that of local authorities, but this was not implemented. It’s a marvellous document, and I strongly recommend it to anyone interested in early British film or the social history of film. It’s available for download from the Internet Archive in DjVu (28MB), PDF (69MB), black-and-white PDF (21MB), and TXT (1.3MB) formats (the latter essential for word searching).